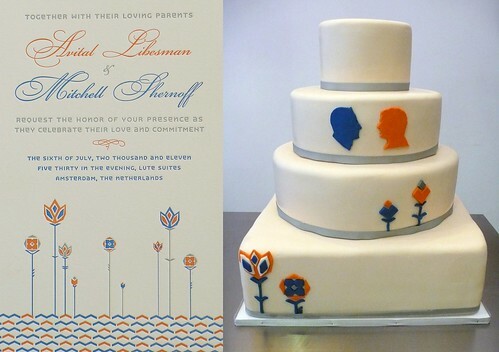 Avital & Mitchell - Invite & Wedding Cake, a photo by CAKE Amsterdam - Cakes by ZOBOT on Flickr. Wedding Cake design was inspired by their amazing invite which GROOM Mitchell Shernoff designed! Cake flavor was red velvet with lavish layers of white chocolate cream cheese icing. The cake also received fresh flowers at the location - Lute Suites.